Today’s the day you can finally get your hands on Nintendo’s attempt to squeeze a little more revenue out of the NES games library. That’s right, the tiny NES Classic Edition is finally hitting stores, which got us thinking, does Nintendo have an SNES Classic Edition in the works too? Compared to today’s blockbuster video games, the titles available for the 8-bit NES look downright prehistoric. But the 16-bit aesthetic of the Super Nintendo’s game library still has a certain charm, and we’re dying to relive some of our favorites from that era in gaming. So much so that we’ve gone ahead and done Nintendo’s hard work for them, creating a list of the 30 games should be included on an SNES Classic Edition. Our list is in no particular order—we’re not trying to rank them—or claim your favorite game isn’t as good as ours. But if you disagree, or think we’ve overlooked a classic, please feel free to let us know in the comments. You can’t have a Super Nintendo, no matter how big or small, without Super Mario World. The game came free with the original SNES, which was an amazing bargain given it has a legitimate claim on being the greatest side-scroller of all time. Added bonus: it also introduced us to that awesome Yoshi sound effects. Despite a lack of 3D, and Link’s trusty sidekick, Epona, the 16-bit version of The Legend of Zelda was a grand sweeping adventure that felt like it would never end. But when you finally defeated Ganon, the game sadly did come to an end, which is why we really want to play it through again. This game is weird and irreverent (the included strategy guide included scratch and sniff stickers!) and is the perfect “modern” RPG. Brutally ignored during its original release (some of us knew what was up! ), this game is now a cult classic. Nintendo owned the Seattle Mariners, so it wasn’t surprising to see them do an in-house title with the team’s biggest player. But this was a terrific baseball game, as is its sequel, Winning Run, but we’ve only got room for 30 titles here. The Super Nintendo lacked any 3D capabilities until Star Fox came along, but by using its “Mode 7” capabilities to spin and scale the background in real-time, games like F-Zero felt like you were actually racing in 3D—and at simulated speeds we’d never seen in video games before. Using the Super Nintendo’s limited graphics capabilities to its advantage, in Super Metroid you lead one of the video game’s first heroines through atmospheric caves and caverns in this third outing in the series. It eventually became a popular title among speedrunners, and we’d love the chance to set a new record. One of Rare’s best games, this platformer had amazing graphics (that 3D was so sick for 1994! ), fun music and challenging puzzles. It also gave us Diddy Kong, the cutest sidekick ever. How do you not include Super Mario Kart on a tiny SNES console? This game launched a franchise that is still loved today and really helped make racing games fun for those of us without Formula One aspirations. Also, one word: multiplayer. Most flight simulators are designed for wannabe pilots who want access to every last button, lever, and control you’d find in a real cockpit. But Pilotwings successfully turned learning to fly in a game that had you coming back again and agai to complete skill-testing challenges, without resorting to dogfights to keep it fun. He’s on fire! From hidden characters to crazy combos, not to mention support for the multiplayer adapter, this is the basketball game everyone wanted to play in the mid ‘90s. And who wanted to stand around a crowded arcade when you and your friends could play in the comfort of your parent’s basement? Yoshi was the best part of Super Mario World and giving him his own game (with an adorable baby Mario to boot) was pure genius. This game was also more challenging than your typical platformer, with great replay value, which is why we’re desperate to play it again. The SuperFX graphics might look primitive by today’s standards, but they were bomb in 1993. A fun space shooter that prepared us for even better Star Fox games on later Nintendo consoles, and taught us all how to hate an annoying spaceship-flying toad named Slippy. Even if you had absolutely zero interest in vampires, monsters, or other creatures that only come out at night, Super Castlevania IV was a fantastic platformer with an even better weapons arsenal. We could spend hours just flipping Simon Belmont’s whip around. Another incredibly fun arcade title that you could finally play at home, Turtles in Time is still one of the best TMNT video games of all time. At times it was a mad hack and slash as you battled the foot clan, but being able to hurl bad guys at the screen kept you entertained for hours on end. We’ll admit, it might be a little a difficult to enjoy Mario Paint without its original mouse accessory. 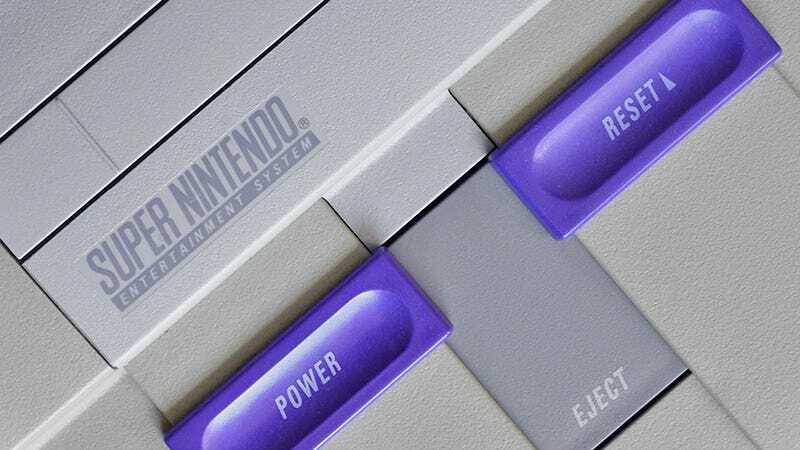 But Nintendo can just sell it as an SNES Classic Edition add-on, because we’re desperate to play with the game’s music composer that you let you recreate your favorite songs using classic Nintendo sound effects. It was chiptune for the masses. Mario and his friends have appeared in almost every video game genre imaginable, with varying levels of success. But going from a side-scrolling adventure to a role-playing game might have been the plumber’s most successful transition. Nintendo wouldn’t allow blood in its home port of Mortal Kombat, but for the sequel, the company let it all fly out in one of the best arcade ports of the era. Admit it, you studied those finishing moves harder than you did for any test you ever took in high school. Johnny Cage wins! You can’t have Mortal Kombat on a tiny version of the Super Nintendo without Street Fighter. There were a lot of iterations of Street Fighter II on the SNES, but Turbo is the one you probably played the most, or referenced when you were making fun of your MK-loving friends. The Legend of Zelda games are as much about hacking and slashing as they are about solving puzzles and exploring dungeons. So if you prefer video game battles that are a little more strategic, you need a Final Fantasy game in your collection, and FF III’s turn-based battle system won’t have you just mashing your controller buttons to victory. On a console with a ton of great role playing games, Chrono Trigger might just be peak RPG. Developed by a “dream team” at Square, Chrono Trigger introduced many RPG tropes that became common place, such as multiple endings and side-quests. The game also has some of the best 16-bit music ever produced. One of the first video games that felt like you were playing an actual cartoon, the game, featuring a heroic worm in a bionic suit, had a fantastic sense of humor and refused to take itself seriously. At times the suit even used Jim as a tool, and a weapon, even if he never seemed that happy about it. Even if you’ve never dreamed of working on a farm, this farm simulator packs so much whimsy you might have actually considered a career out in the country when you grew up. It may ultimately be responsible for games like Farmville today, but that shouldn’t exclude it from this list. On the surface, Secret of Mana looks like a classic Zelda clone, but under the hood the game is much more than that. Not only was its real-time battle mode absolutely revolutionary for the time, the game took multi-player to a whole new level, with support for up to three players. Secret of Mana has been ported to modern consoles and even mobile phones, but it will always be best in 16-bit. Most fighting games focused on hand-to-hand combat and featured characters rooted more in fantasy than reality. But Samurai Shodown, set during Japan’s feudal era, focuses on weapon-based combat favoring well-placed strikes rather than over-the-top combos. And unlike the original SNES version of Mortal Kombat, there’s tons of blood. Despite being some of the most frustratingly challenging side-scrolling platform games, you can’t have a tiny Nintendo console without a Mega Man game. The NES Classic Edition has Mega Man 2, so the SNES equivalent should includes the first 16-bit edition to that series. Even just thinking about its back-and-forth, tug-of-war grapple system probably makes your hands and fingers sore. But this wrestling game is worth playing again if only for the reason you could “accidentally” knock out the referees and do whatever you wanted to your opponent. There were a lot of TV and movie-based titles for the SNES, but Tiny Toon Adventures: Buster Busts Loose! is a surprisingly good game. The graphics were adorable and the mini-games were so much fun—and this was before the world knew about Mario Party. The Sega Genesis was considered the console to get if you were really into playing sports games. But the Super Nintendo held its own, thanks to EA making many of its games available on both system. And while the NHLPA Hockey ‘93 rosters are horribly outdated at this point, it should definitely still include its wraparound shot cheat. The NES had Tecmo Bowl, but the SNES had Madden ‘94. Great graphics for the era, and superb gameplay, this was the football game that introduced “bluff play” to the world. This action RPG might not have as many fans as The Legend of Zelda or Final Fantasy, but its story was good, the puzzles were challenging, and the graphics pushed what the Super Nintendo’s 16-bit hardware was capable of. Seeing it on a modern big screen TV will be a real nostalgic treat.